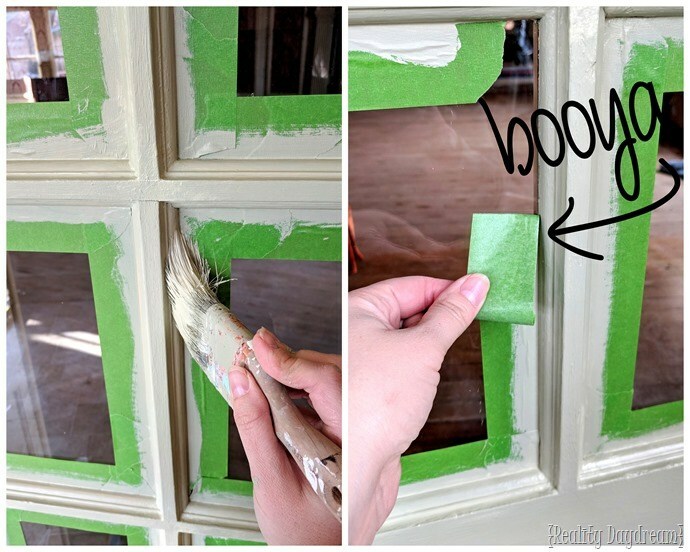 Tips for painting around trim and window panes with painters tape! I was pretty nervous to hit publish on that last post, revealing that we’re moving. But you guys have been so incredibly supportive and excited for us! It’s definitely going to be an adventure! 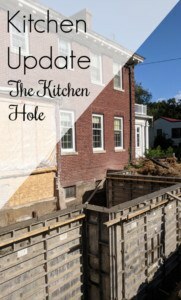 I’ll be sharing more photos of the house, and details about what big projects we’re tackling first. (In fact, if you’re anxious to see more of it, I did a quick Facebook LIVE yesterday HERE giving a tour of the house. I’ll also be doing a more formal video tour soon for those that don’t have Facebook). But it’s safe to say this place is going to be in some serious disrepair for a few months while we renovate. Knowing exactly how icky it feels to live in a hot-mess home, covered in drywall dust and the like, I’ve decided to choose one room to make my haven. This will allow me to get started on some projects that will allow me to see progress even in the midst of all the renovation chaos. 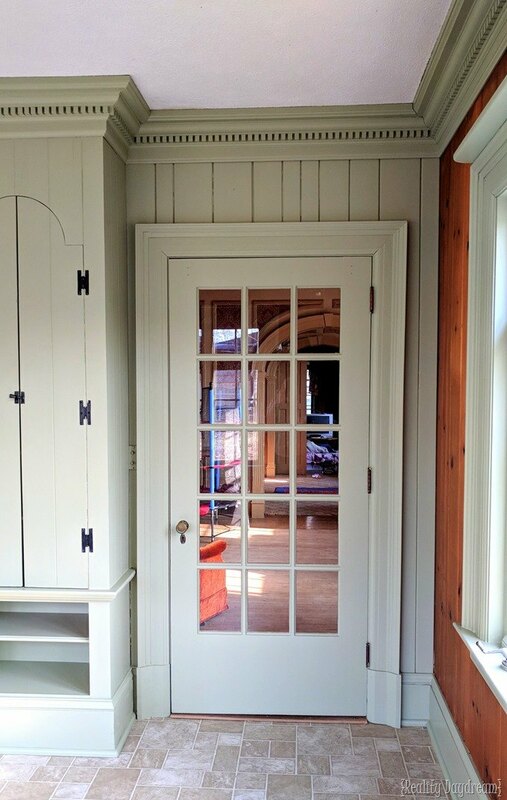 One of the things I love most about this house is all the beautiful trim. It’s so chunky and ornate! And my first big project in this sunroom is to tackle painting that trim. ALL OF IT. I knew it would be daunting, but it would also make a HUGE difference in this room. I kinda like the wood walls and have decided to embrace them for now. But the bright yellow JUST HAS TO GO. This room is already so bright (because, sunroom), and the combo of unlimited sun and neon yellow makes my eyes physically hurt. 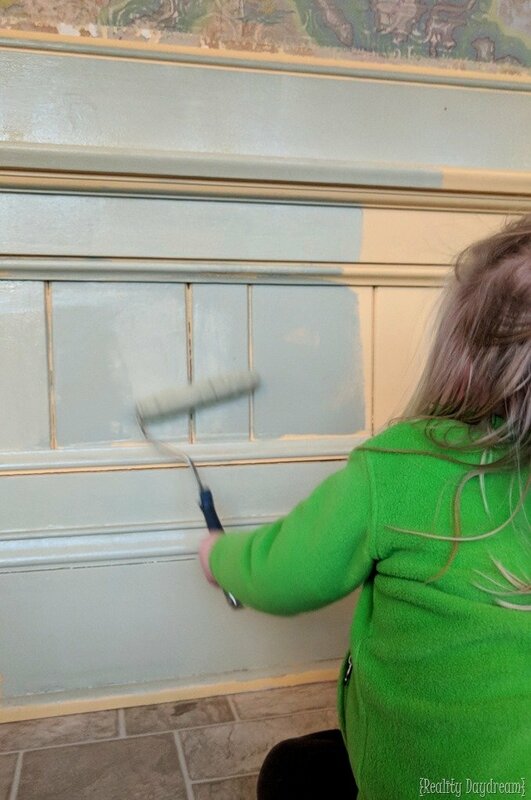 I’ve been loving a muted sage green lately, and decided it would be the perfect shade for all of this trim. It still reads as a color, but is muddy enough that it could also be considered a neutral. 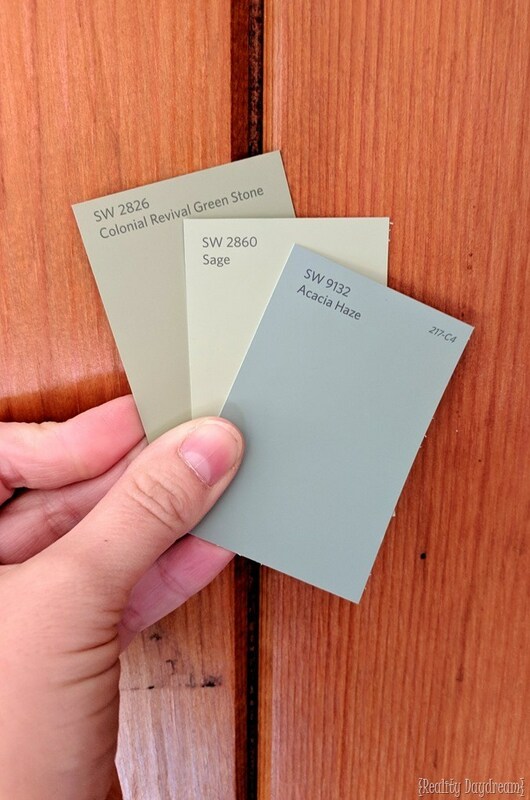 I had a lot of trouble deciding WHICH SAGE to choose, and ended up heading to SW to pick up some sample pots of paint to help me feel more confident about my decision. Sometimes when I’m struggling between a couple of colors, I’ll just go ahead and pick the one that I love the name of the color best. HAHA! Acacia Haze ended up being a little more blue than I wanted. And colonial Revival Green Stone ended up being darker than what I wanted. So we went with boring ol’ Sage. Who names these colors? They couldn’t think of anything more creative than SAGE? I guess it’s easy to remember in case I ever need to buy more for touch-ups. I’ve been known to be pretty cocky about my ‘cutting in’ abilities. 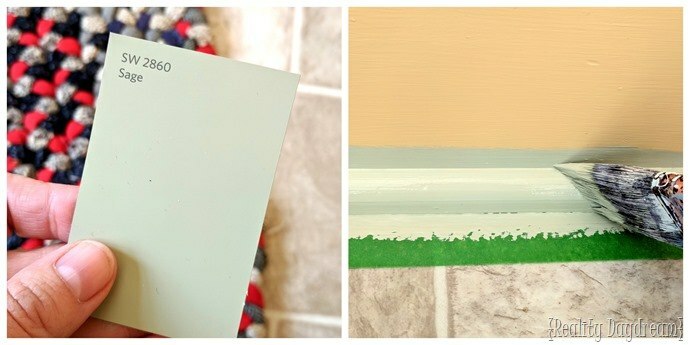 If you’re not familiar, ‘cutting in’ is a term used for when you use a paint brush to paint along the edges of things. Like trim. Basically anything that can’t be rolled with a paint roller would be considered cutting in. So I’m fairly confident about my cutting in skills, but all of these window panes on both french doors and the exterior door would just be tooooooo much. I’m getting an ulcer just thinking about trying to hand paint those without the help of painters tape. 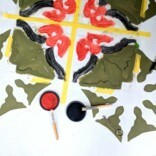 So I was overjoyed when FrogTape wanted to partner with me on this project! 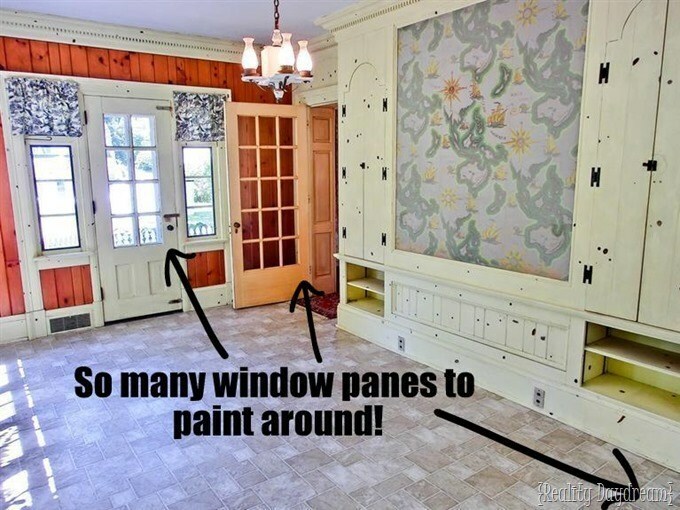 Yes it took some time to tape up the windows, but I guarantee applying painters tape took less time than it would have to carefully hand-paint all those muntins. And that’s not even considering the amount of time it would take to come back and touch up my work and scrape rogue paint off the glass. Just to give you an idea, it took me about a half hour to tape off this door. And that is a HUGE WIN in my book. For the first time ever, I downloaded a ‘book on tape’ (Girl Wash Your Face by Rachel Hollis) and binged listened for mannnnny many hours whilst painting this room. That’s an amazing book, and it was a fun read for getting my paint on. Between that and the ease of using Frog Tape rather than being over-confident about my cutting skills, this actually ended up being a pretty fun job! 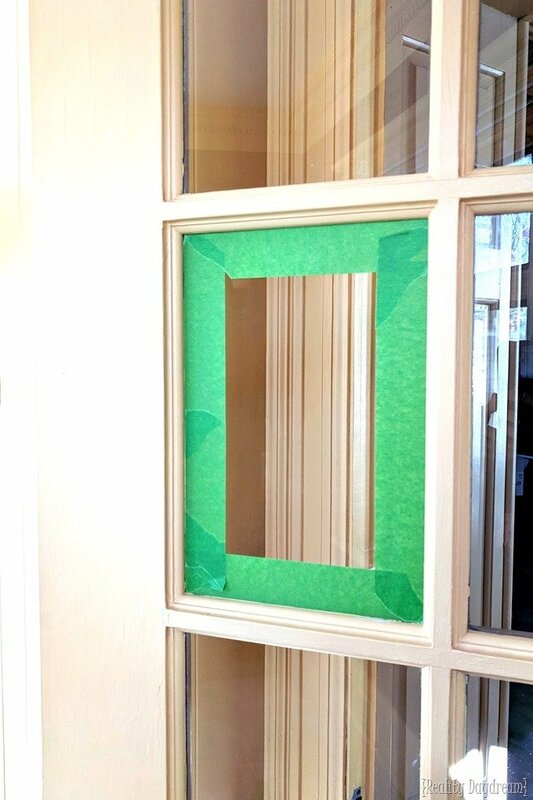 Oh, and the window panes weren’t the only place that painters tape came in handy. 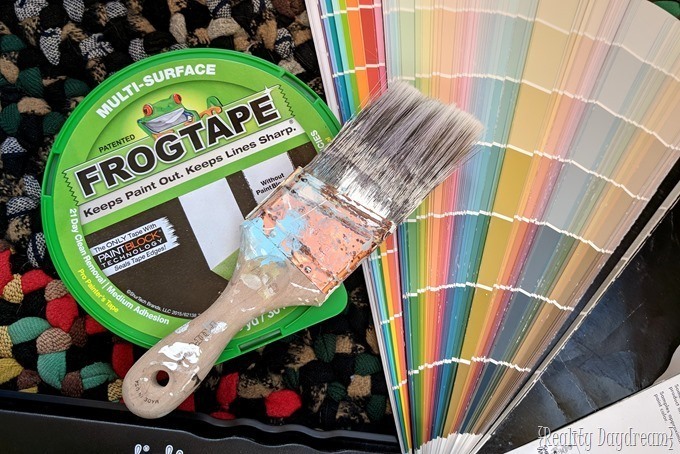 So the thing that makes this painters tape so special is that Frog Tape is treated with patented PaintBlock technology. Basically that means that this painters tape has an adhesive with a super absorbent polymer that reacts with the water in latex paint. 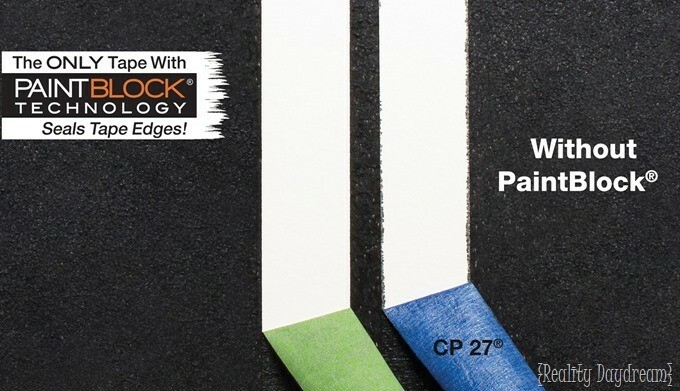 This immediately gels and creates a barrier that seals out the paint. Like magic. Paint bleed and touch-ups are the bane of my existence, so I’m loving this particular advancement in technology. Since this room is almost entirely trim, there wasn’t much rolling to do. But in the few places where rolling worked, I let my eager girls help out. It’s purely coincidental that she’s wearing a Frog-Tape-green jacket. I got by with just doing two coats since I bought pretty high quality paint. 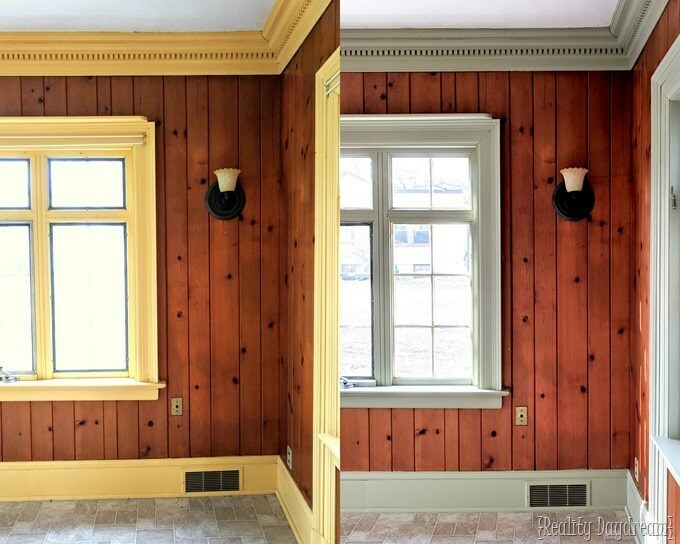 Believe it or not, this room full of trim used up an entire gallon of paint. This is the first time ever that it took 35 hours of painting to use up one gallon. HAHA! 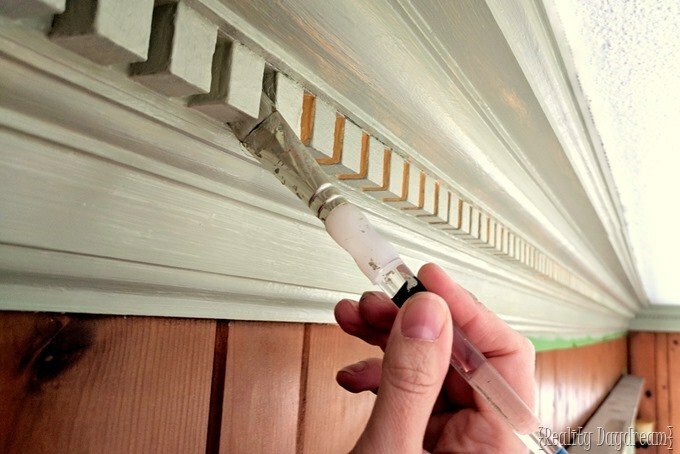 These grooves in the crown molding are called ‘dental molding’ because they look like teeth apparently? I think they look more like piano keys personally. 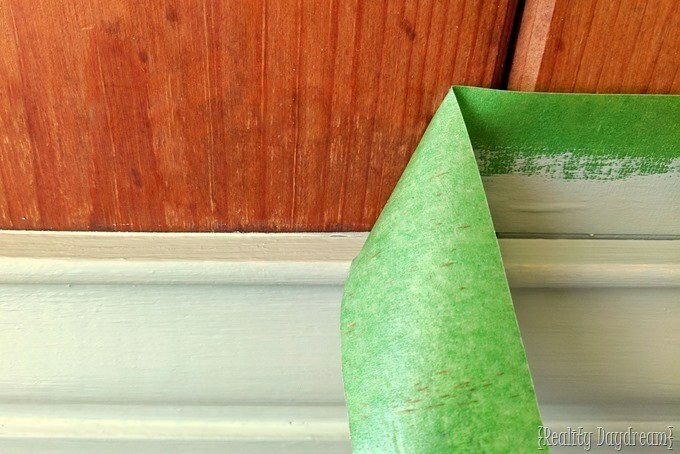 When using painters tape or masking tape, be sure to remove the tape before the last coat has dried. Otherwise it tears and is harder to get off all in one piece. Would you look at this beautiful crisp line? 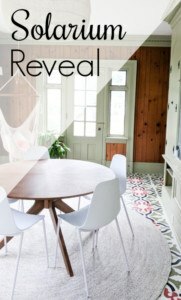 Painting this room was probably the single most time-consuming project I’ve ever done on this blog. But it was fun! And I feel strongly that the outcome was SO worth it. I love it SO much better than the yellow. 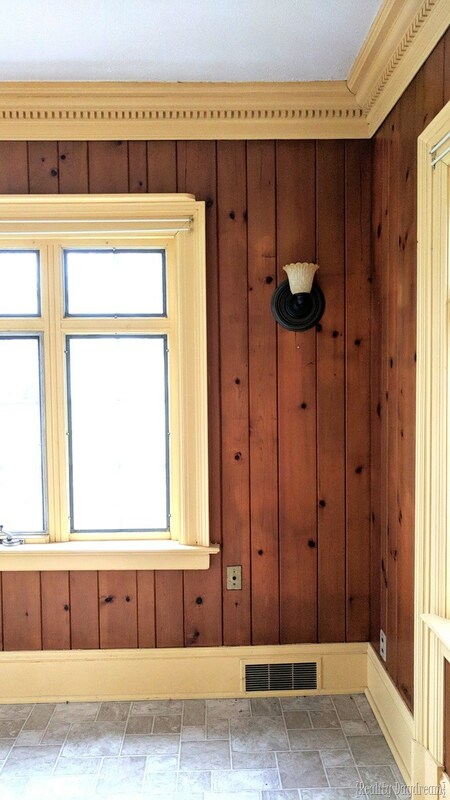 I know some of you probably don’t dig the wood walls, but would it help if you knew it wasn’t wood paneling? It’s actual wood planked walls called carsiding. 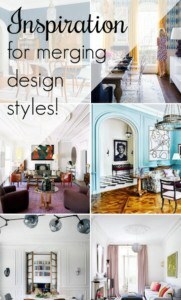 And I kinda like it paired with the chunky molding and bright sunny windows. I can’t wait to fill this room with plants, and have a sitting area for reading, and maybe even a table for crafting! 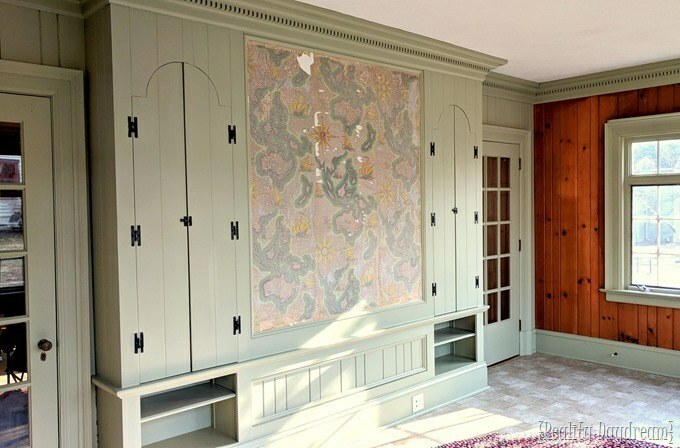 Those built-ins (pictured above) will hold board games, activities, crafts, etc! All of the things I want accessible to the girls whenever they want. And that big flat panel in the center has some really cool map wallpaper on it that I love for now. (fun fact, it’s actually the back of the fireplace!) But eventually I might paint that section with chalkboard paint, OR hang our big vintage map on it. We’ll see! Next on the list for this room is to update those sconces and possibly put in a ceiling fan (since I’m guessing this room will be HOT in the summers). 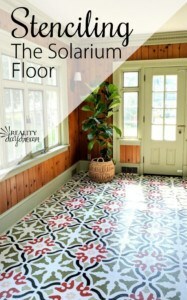 I’m also planning to paint/stencil the flooring for a temporary fix until we get around to truly updating it. Be cause that linoleum (barf). This next pic is a little wonky and out of focus, but I wanted to share it just so you could see this angle with the wall o’ windows AND built-ins all in the same line of vision. Isn’t this room such a dream? These doors will remain CLOSED during the messy renovation in an effort to keep out all the drywall dust and other nasties. It will be the calm in the storm and provide a clean and cheerful place for us to retreat from the chaos whenever we need. 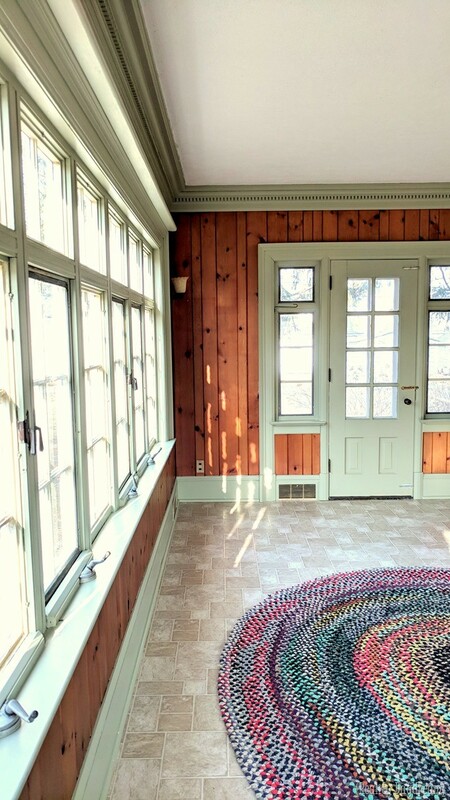 I’m excited to continue tackling fun little projects in this sunroom. Be sure to follow our Instagram Stories (@Reality Daydream) for lots of behind-the-scenes tomfoolery, and help us make some decisions when we post polls. It’s super helpful to hear you guys weigh in! Oh my. This is where a spray paint gun would so come in handy: frog tape + newspaper then spray. A room like this would take a few hours at the most. And you have so much more to do. But I LOVE IT! Wood, linoleup, map and all. Andcyes, it needs a fan, maybe a fancy rattan one, plantation like. Then you can sit there and drink mint juleps or sasparillas. Um, that’s an amazing idea. Looks great! I love the dentil trim, but I’m sure it was a beast to paint. 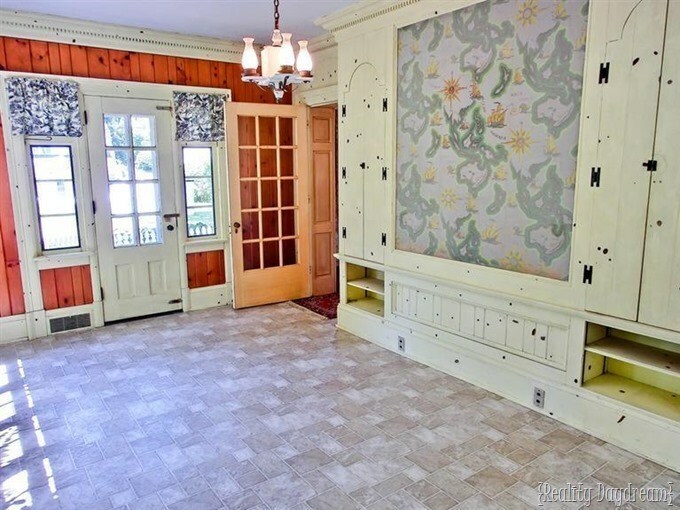 My parents’ house has carsiding in the living room and the dining room (although we call it barnsiding!). They’ve lived there for 47 years and are finally (FINALLY!) going to paint it lighter. The dining room is about the same tone as your room, but the living room is very dark. I think it will really brighten up their room. 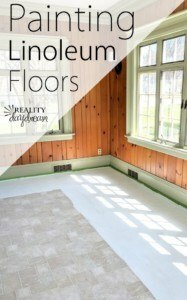 I actually like the linoleum in your room… but not for that room (if that makes sense). Looking forward to see what you stencil on it! 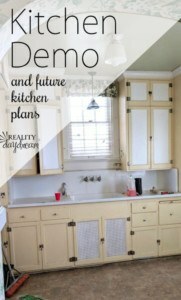 So excited for your reno! 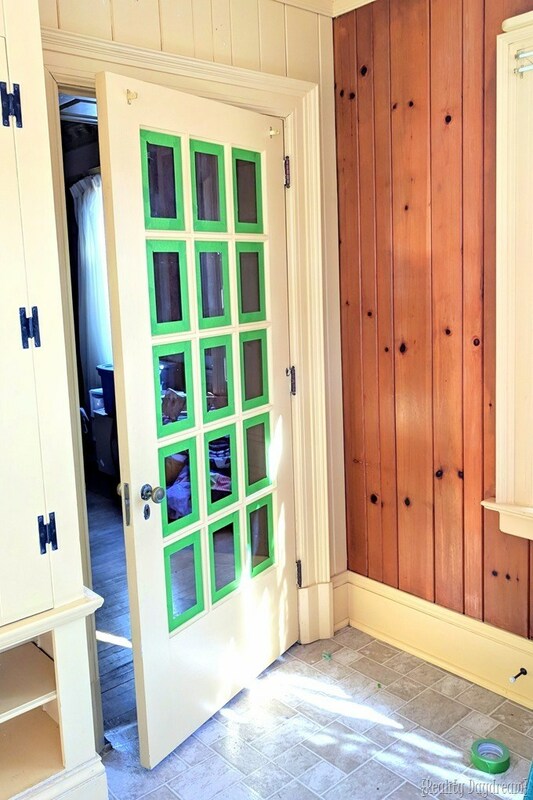 And I love the green paint and wood 🙂 I do not, however, envy all that trim painting. 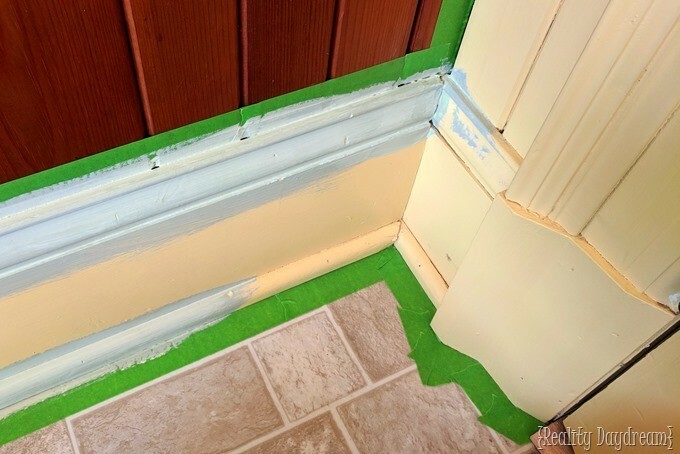 I put off our kitchen reno in our last house for five years because I couldn’t bring myself to paint all the dentil moulding after doing the living rooms. 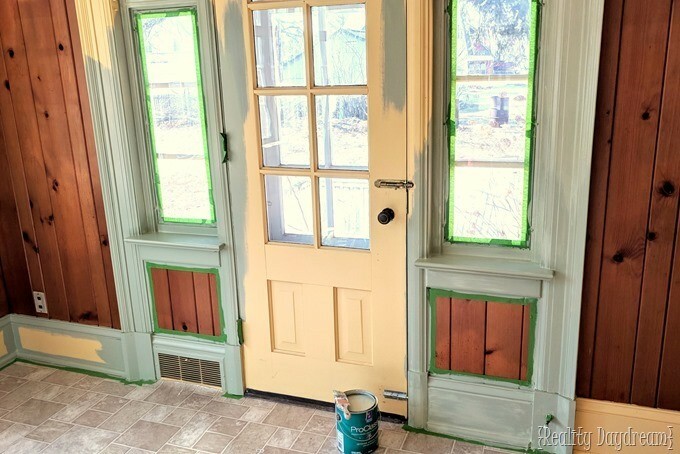 Dentil moulding and paneled doors/windows are the worst things ever to paint! I’m kinda butting in on a conversation..
(No pun intended)… Never be easy me… I also like the floor that is there… But not that room… Maybe a light colored brick linoleum… Pattered… But then your going to paint a boarder… I’ll just have to wait and see your choice… I’m sure it will be Beautiful… Sooo.. I love this space, can hardly wait to see the end results. I know everything will be soooo fabulous. Looks AMAZING! !Never underestimate the potential of ‘boring ole sage’. It really compliments the real wood planked walls, ( which I would totally keep, knowing it’s not paneling..sweeet!). Soon as I saw the “after” photo my brain instantly went to lots of various, green plants. 1-Vintage map for center space-back of fireplace. 2-I must go out and buy some Frog tape and paint.. something, just so I can see the awesomeness of this product! That’s a lot of work! Awesome details. 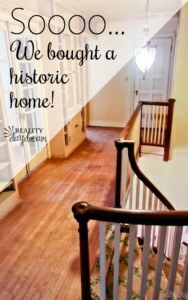 And to think all of this because of a great realtor! Throw down some door mats to wipe shoes when coming into the sun sanctuary. I loved the tour on FB. Thanks for doing that. It was fun to hear your dreams and ideas for its future use. The sage in this room is beautiful. 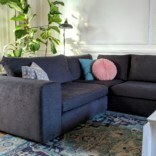 It updates the look and calms the atmosphere. 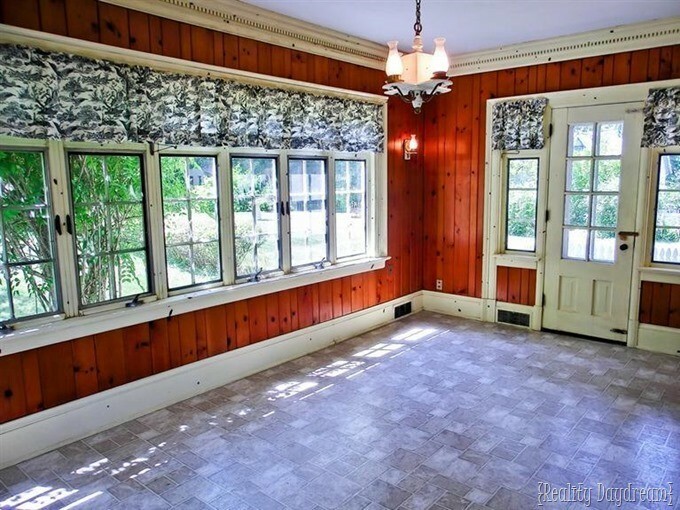 I think that big panel would be wonderful as a chalkboard, especially if this will be used as a family room. This room is beyond beautiful. 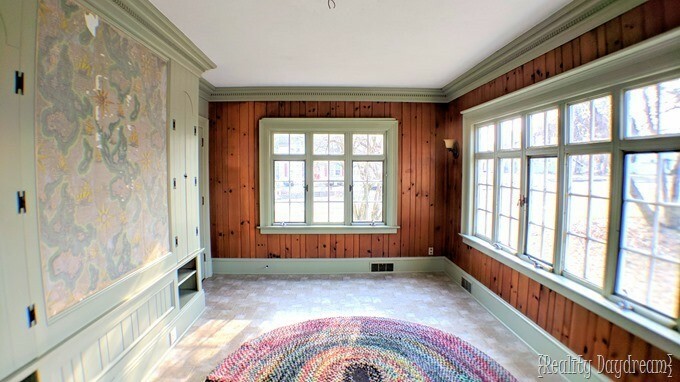 I love that wood trim and the built-ins. The sage is perfect with the wood and it is restful on the eyes. I am so excited!! I can’t wait to see the next updates. You are so lucky and I’m completely jealous! The green color, I wasn’t so sure about but the more I see it the better I like it and it is so you. That room is going to be so great for you and your family and your future plans for it are wonderful. Did you know that they make a film you can put on windows to block the heat from coming though? 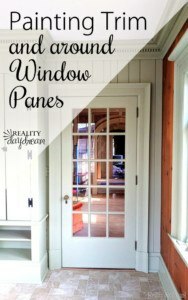 It isn’t cheap but so worth it in the summer time and definitely less expensive than new windows. The film offers privacy as well. I put it on windows that were southern facing in a place were we lived for a year (there was no air conditioning) and it made a huge difference. If I had a vote for the wall space with the built-ins, I’d say hang your map there. It appears to be too high for a good chalkboard for the girls. I can’t wait to see your other changes. Once again – You are so lucky! P.S. 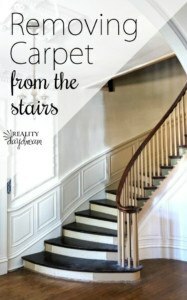 I wondered what happened to the braided rug that was in the attic family room! And now I know. I love the color and the wood walls!! Beautiful! 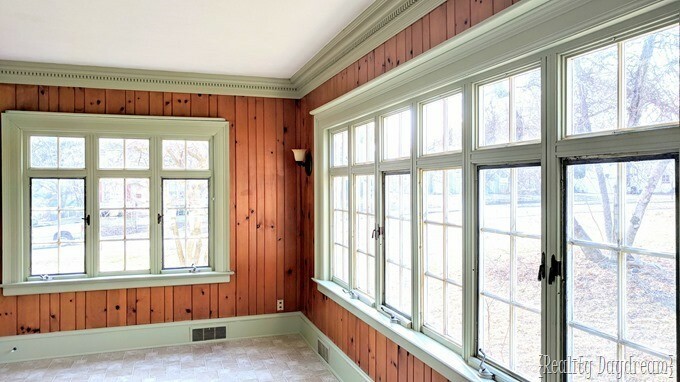 While I’m a bigger fan of white woodwork/trim, I like the wood with the green. Wood and yellow usually gives me flashbacks to the 70’s “yellow/orange/brown” colors! I love the Sage and the wood – because you painted out the none-window side of the wall, I would leave the wood – it gives a bit of warmth . 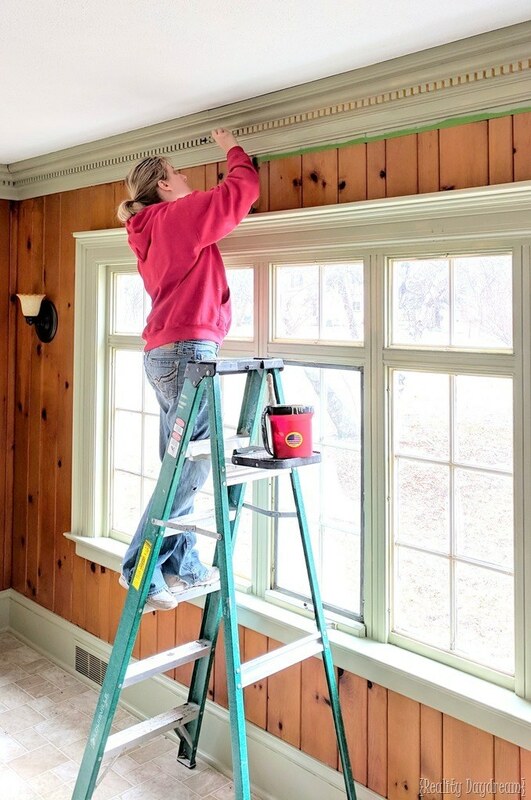 I’m feeling intimidated by just painting walls – not even fancy trim. You did a great job! 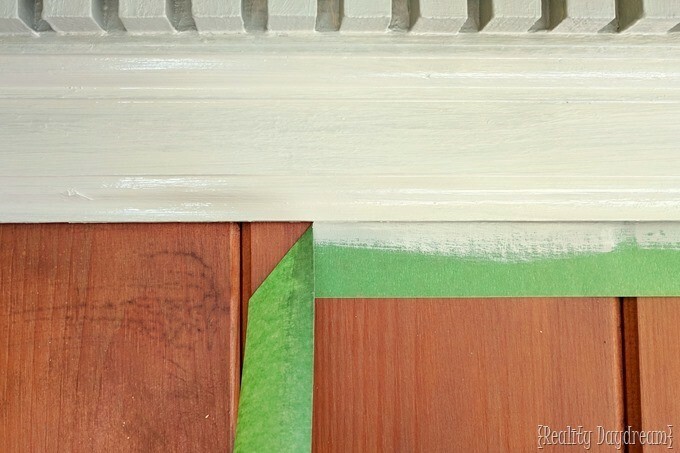 Interesting how the new color of paint makes the wood look more beautiful and less dated. LOVE it! I love it!! and I love the real wood walls. If anyone ever gives you grief about it, just call it “vertical shiplap” hahaha! !